What The Beating Heart Center (BHC) can off you, is a more excellent training preparation for all your medical, disaster emergency needs. The BHC is a medical education center for the community, corporations, and government facilities. We can help you become confident in responding to any medical emergency. We like to show you the top eight programs we have to serve you. #1 CPR/AED for community and Healthcare workers. The Beating Heart Center provides a basic CPR and AED course for the community and our healthcare professionals. The basic CPR and AED course are for the community and those that need a basic certification for personal knowledge or their organization. CPR training is required to be prepared for anyone who suffers from sudden cardiac arrest (SCA) or choking. With the basic training, we teach you how to use and Automated External Defibrillator (AED). 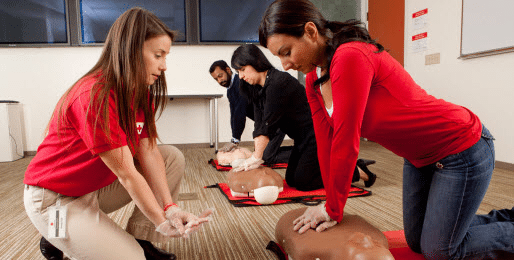 Healthcare CPR training is also known as Basic Life Support BLS is for all professionals who may work with patients. The BLS training is the core knowledge that all medical professionals have to know. If a medical professional is not proficient in basic life support, then they will not be successful in helping patients with more advanced knowledge. BLS is the foundation for all medical professional’s knowledge in saving lives. The BHC guarantees that all professionals will receive the proper certification and training required for their employers. You probably think that in the last passage don’t most training center teaches CPR/AED and BLS? The answer is yes, but The Beating Heart Center has a blended program which provides proper training at your convenient. Most people are nervous using a blended course because they are told online classes are illegal. The truth is that online only CPR course is not acceptable by any major training brands or through Occupational Safety and Health Administration OSHA. Blended courses are where we send the video and tests to your email so you can work at your pace. When you complete the online part of the course, you then meet with an instructor to focus on your skills. More students prefer this training because it works all around their schedule and meeting with an instructor is by appointment versus blocking 4 hours out of your schedule for a class. Proper use of a spinal board and C-collar for spinal immobilization. Pet first aid is a subprogram with The BHC to help the community know how to save their dogs or cats medical emergencies. This class helps you know how to identify any medical problem your pet may be suffering. We show you how to make a muzzle and what you need in a first aid kit for your pet. This class is ideal for all who like to know how to keep your pet safe. The BHC has newly released the Child and Babysitting Safety (CABS) course. CABS is a program for young teenagers who may want to start a business in learning the responsibilities in babysitting. The class empowers the student to know how to take charge when they are responsible for child safety. The course shows basic first aid and CPR for child and infants. How to keep a house safe for the child you are babysitting. The Emergency Medical Responder (EMR) course is for all professionals who need equivalent medical training as an EMT but does not want to keep a national registry. The training for this class is intense, and it covers all possible medical emergencies and how to deal with disasters. The required time for training is 48 hours. This program is usually good for Law Enforcement, Life Guards, Firefighters, and any professional who needs to know how to stabilize a patient and transport to medical facility. Wilderness first aid is our new training course that BHC provides. The wilderness first aid is not just for people in the woods but to be prepared when a disaster happens and medical support is saturated. The Beating Heart Center provides a basic First Aid for levels like the Boy Scouts basic survival. Wilderness intermediate is training for advanced hikers who may be placed in a situation they have to stabilize the patient. Then there is the expert who is being self-reliant in any situation. This course shows you how to improvise any situation and save the lives of those you are with. #8 Service and sale of Automated External Defibrillators AED. The Beating Heart Center is now proud to announce we can sell and provide support for the Automated External Defibrillator AED. The AED is a device used for a person suffering from sudden cardiac arrest SCA. We will give you an AED, and we will make sure that the unit is ready to operate when you need them the most. The BHC can take care of all your Emergency medical training and supply you with the proper equipment to be prepared. We want to make sure all are ready for when you need this knowledge the most.